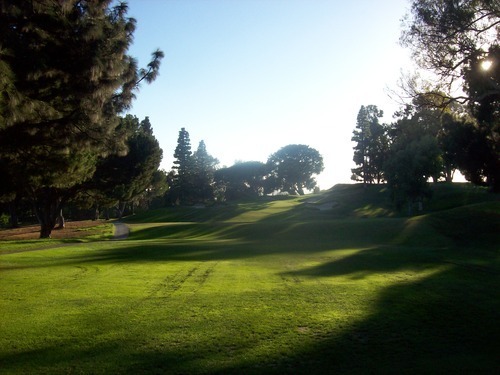 Note: They have since changed the name to simply The Saticoy Club. 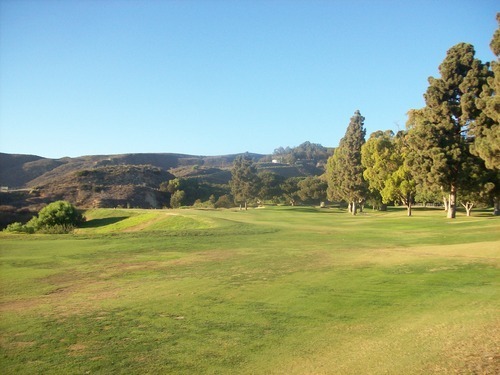 On Friday, I had the great opportunity to play Saticoy Country Club up in Somis (just outside of Ventura). This is one of those old private clubs I’ve always heard great things about, yet there was still some mystery to it as it’s always been known as one of the more exclusive memberships. I was invited out as a guest with Greenskeeper.org and was happy to take a half-day off of work to make the two-hour trek up the coast. 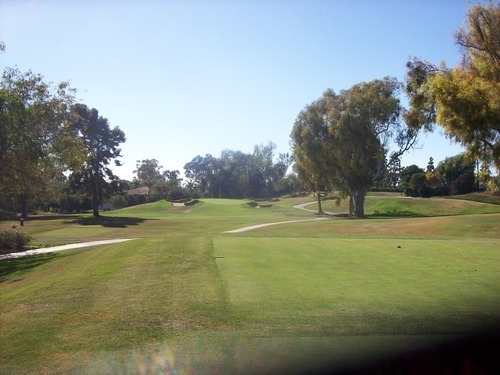 The vibe around the clubhouse at Saticoy is very casual and we felt comfortable as guests. 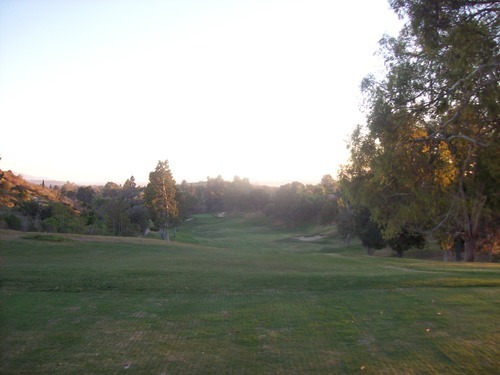 We teed off as a foursome around 2:00 and it wasn’t busy at all out there, so we enjoyed a fun and relaxed pace, finishing just before it was too dark. I was happy we got all 18 in, though my pictures didn’t come out that great on the final few holes because of the harsh lighting. 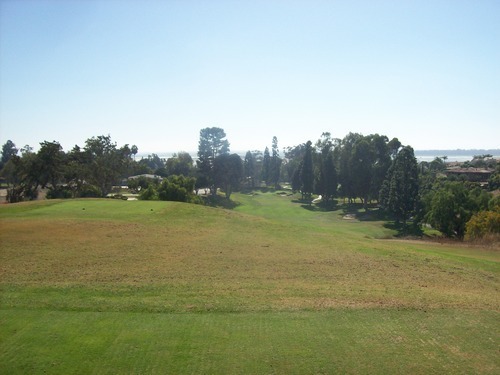 Saticoy Country Club was formed in 1921 as Ventura County Country Club and the original course is what is now Saticoy Regional Golf Course—a public 9-hole track I played last year. 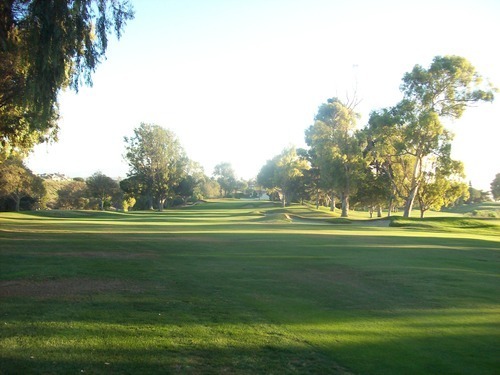 In the 1960s, they decided to move and hired William P. Bell to design the new full-18 course. 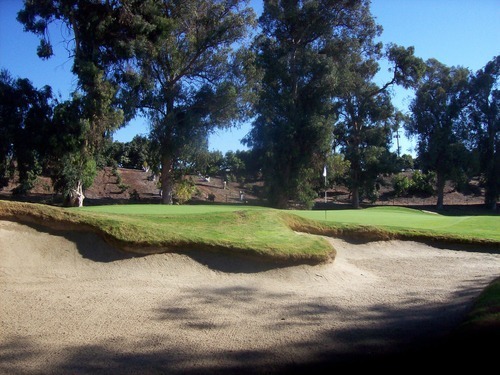 Over the years, it has since been enhanced and refined by notable architects like Robert Muir Graves, Tom Doak and John Harbottle III, who helped shaped the course’s distinctive bunkers. 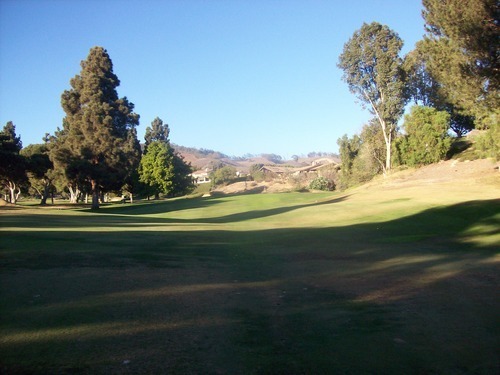 The Saticoy course is in a great setting up on a hillside overlooking Camarillo. 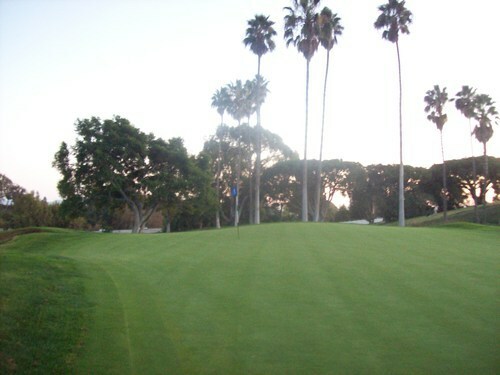 The first tee shot sets the tone with an elevated tee box and an intimidating green complex waiting in the distance. 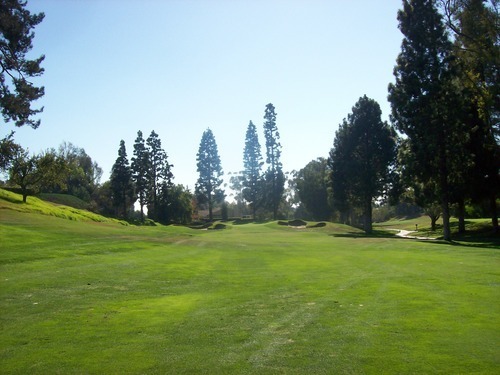 Indeed, it is the greens and bunkers that are the story at Saticoy. Around the clubhouse, the workers, knowing we were first-time visitors, warned of the super slick, yet pure as pure can be greens that are notoriously “deceptive.” Nobody really said anything about the sand traps, but that’s the first thing you’ll definitely notice when you see the course. 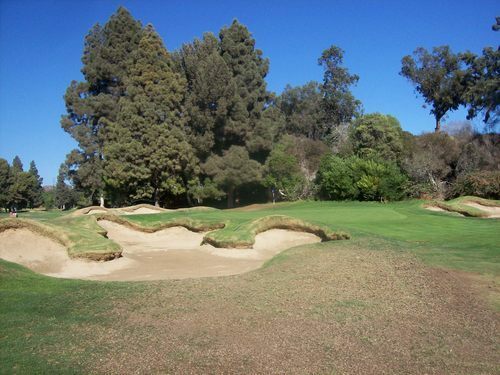 Regarding those nasty bunkers, the most similar comparison I have is Fallen Oak Golf Club, a Tom Fazio course in Mississippi that I had the pleasure of playing earlier this year. In a way, they have almost a “prehistoric” look to them with severe faces, intricate shapes and rounded grass faces that are equally beautiful and menacing in appearance. However, I didn’t feel the ones at Fallen Oak came as much into play and weren’t too tough to avoid. 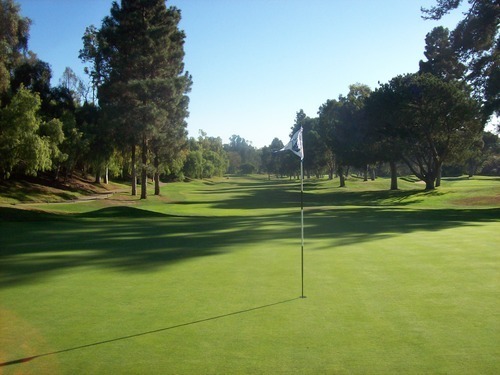 At Saticoy, they are right in your face and very much in play guarding the greens. 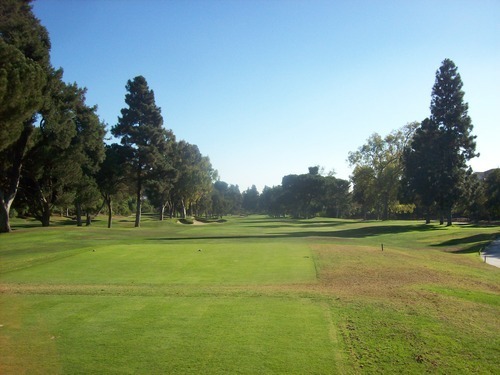 You will likely find yourself in at least one before your round is through. 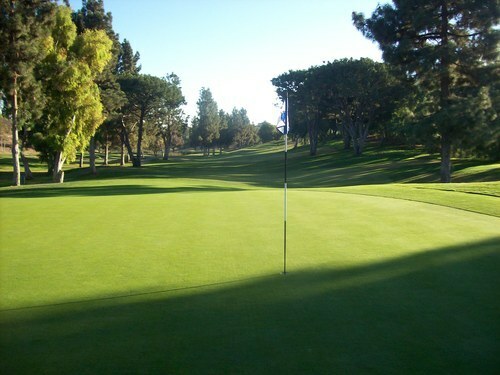 The greens aren’t overly complex in terms of undulation, but they are indeed deceptive. Of course, they are known to roll at fast speeds, which makes every putt so delicate (especially those pesky downhillers). 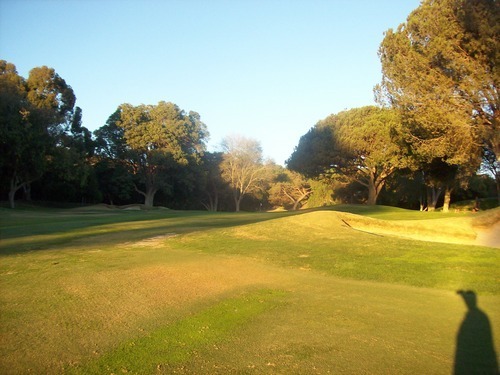 Because the course is built against a hillside, the natural break does have a significant effect and is what really adds to the deceptiveness. Sometimes what looks uphill is actually downhill and vice versa, so you really have to factor in everything before hitting any putt. 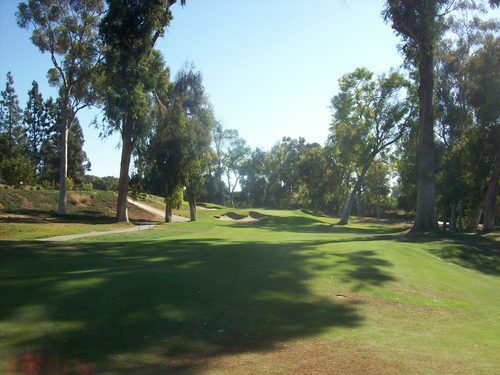 The trees at Saticoy are also a big factor in the shot shapes you need to hit and positioning off the tee, as you might expect on most older course designs. Here, they are a mix of tall eucalyptus and pines, which adds to the secluded feel of the setting. The front nine here is very good, but the back nine definitely steals the show. 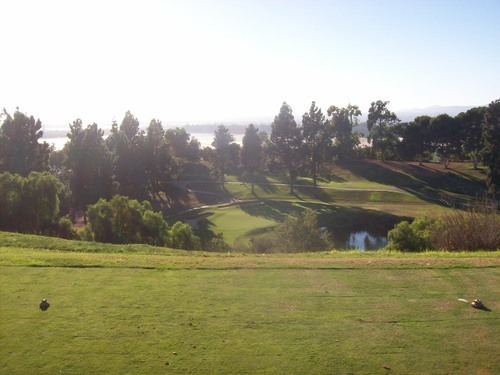 It starts with a fantastic par-3 hitting straight downhill over water with nasty bunkers behind to catch anything that goes too deep. Perhaps the most interesting stretch, though, is found on holes 13 and 14. 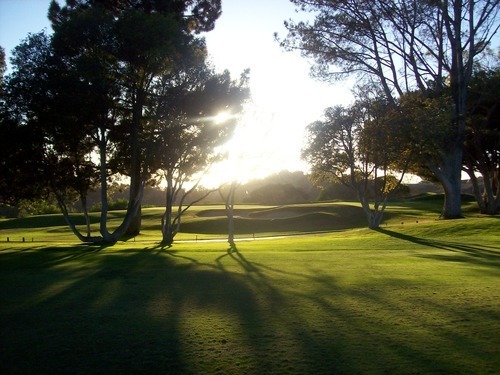 When we all turned the corner and saw the par-3 13th, which was glowing in the evening sunlight, all three of us guests pretty much simultaneously remarked that it looked a lot like Torrey Pines. None of us were expecting that. The same thing happened when we reached the tee on the par-5 14th, which plays around the edge of a little cliff. If you replaced the avocado orchard on the property next to it with the Pacific Ocean and parasailers, it would be a spitting image of Torrey. The course was in decent overall condition, but clearly the drought has had its effect here. The tee boxes were great. The fairways were a bit patchy with a couple different grasses and some thin spots here and there. They didn’t always look super pretty, but I had nice lies most of the time. The rough was more hit or miss. They are definitely not devoting as much water to the outer edges of fairways and rough. The bunkers were pretty good, as well. 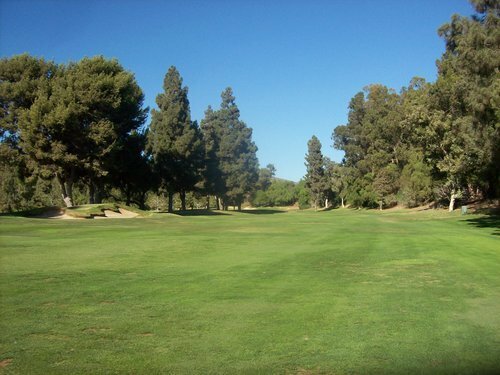 Obviously the most attention at Saticoy is paid to the greens. There were still a few minor remnants of the recent aeration, but they were almost fully healed and rolling well. They were as excellent and as fast as advertised. I can only imagine how quick they can get for tournaments and special events. 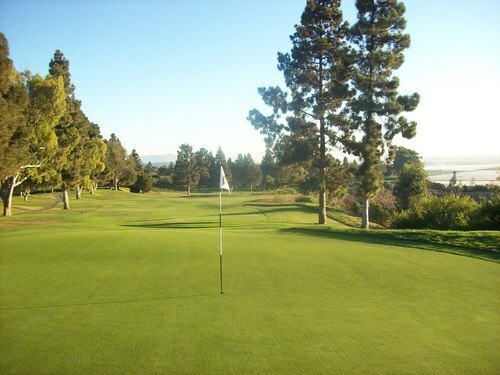 Overall, it was a fantastic experience at Saticoy Country Club and I was very grateful for the invite. Not only did I get to check another great private club off of my list, I got to share it with some good friends on a beautiful day in Ventura County. I would highly recommend taking advantage of any chance to play here if you get access.